Seafood Newburg is a great recipe that we were really excited to be introduced to by my mom (as usual; she has inspired a few recipes). She is a casual paleo chef, and often encourages us to take our cooking to the next level. This seafood dish is amazingly rich and is great on its own, served with gluten-free pasta, zoodles, or over a bed of greens. We think you’re absolutely going to love it. One of the best things about this recipe is that it is accessible with either fresh wild-caught seafood or previously frozen. We’ve done it both ways, and it doesn’t suffer from the frozen seafood. You will want to have an immersion blender on hand for this recipe—if you have a high-quality coconut milk that is separated in the can, you’ll need your blender to get the sauce to blend. If you don’t have an immersion blender yet, get one! We got this one for Christmas (from Costco) and it’s an amazing tool. I can’t believe we waited this long to have one, but I digress. Let’s get cooking. Preheat oven to 350. Grease a 9-inch oval baking dish or 1 1/2-quart baking pan. Cut cod, salmon, shrimp, and haddock into 1/2-inch pieces. Place all seafood in a large bowl. Add the shallot and celery, and toss to combine. Sprinkle the 3 Tbsp of tapioca flour over the seafood and toss again to coat evenly. Set aside. In a 6-quart sauce pan, melt 4 Tbsp of butter over medium-high heat. Slowly whisk in 1/2 C tapioca flour. Reduce heat to medium-low and gradually add in the coconut milk. You will need an immersion blender to fully blend. Temper egg yolks with about 1 Tbsp of the sauce, and add the mixture to the sauce pan. Pour in the sherry and lemon juice. 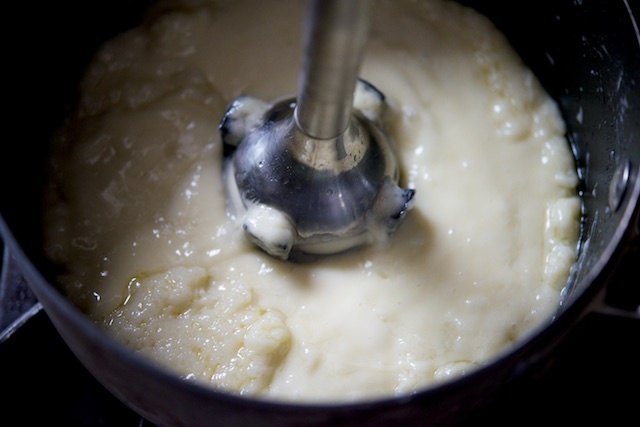 Incorporate the liquids with the immersion blender. Add dill, Old Bay, and paprika to the sauce and blend. Pour sauce over seafood and stir to combine. Then, put everything in the baking dish. Bake for 45 minutes until bubbly around the edges. Serve hot on its own in a bowl, or over rice (cauliflower or regular), pasta, or even salad greens. 1. Preheat oven to 350. Grease a 9-inch oval baking dish or 1 1/2-quart baking pan. 2. Cut cod, salmon, shrimp, and haddock into 1/2-inch pieces. Place all seafood in a large bowl. 3. Add the shallot and celery, and toss to combine. Sprinkle the 3 Tbsp of tapioca flour over the seafood and toss again to coat evenly. Set aside. 4. In a 6-quart sauce pan, melt 4 Tbsp of butter over medium-high heat. Slowly whisk in 1/2 C tapioca flour. 5. Reduce heat to medium-low and gradually add in the coconut milk. You will need an immersion blender to fully blend. 6. Temper egg yolks with about 1 Tbsp of the sauce, and add the mixture to the sauce pan. Pour in the sherry and lemon juice. Incorporate the liquids with the immersion blender. 7. Add dill, Old Bay, and paprika to the sauce and blend. 8. Pour sauce over seafood and stir to combine. Then, put everything in the baking dish. 9. Bake for 45 minutes until bubbly around the edges. Serve hot on its own in a bowl, or over rice (cauliflower or regular), pasta, or even salad greens.